Since the days when certain artists made a joke of hanging mass-produced junk on gallery walls, people have gotten used to a definition of art that is playful enough to include some unusual things: blank canvases, toys, and even trash. And if what we are willing to call art has no fixed categorical boundaries, its untouchability may be the only definitive characteristic that remains. Art becomes sacred not because it is beautiful or unique or because it took hundreds of hours to create, but -- to be perfectly circular about it -- because it is treated as sacred. Even if it was formerly a bicycle wheel. We can find an intriguing statement on this subject painted on the sandwich board outside Li Pon är'-te-fakt's in the Harmony Lot. The board boldly says, "Wearable Art," and it begs an important question: Is it really art, if you can ... touch it? Tom Galbraith, son of store owner Linda Pon Owen, is among the artists featured in this collection of drawings, photos, jewelry, pottery, carvings and kimonos. Despite the festival of colors and textures -- the cases, tables and walls are covered with strikingly beautiful things -- this store has a quieting effect upon the spirit. 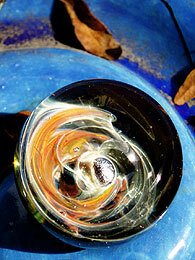 Perhaps Galbraith's blown-glass pieces have something to do with it. 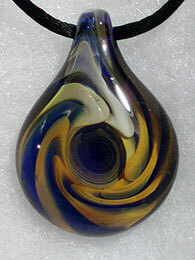 You might stand still for five minutes gazing through one of the pendants. The shape keeps changing, as though you are looking through a kaleidoscope. Sealed within Galbraith's rings, earrings, pendants and marbles are images so fluid, so suggestive of delicate natural objects, that you might have to remind yourself after a few entrancing moments that they are actually made of cold, impermeable glass. This is four-dimensional art. 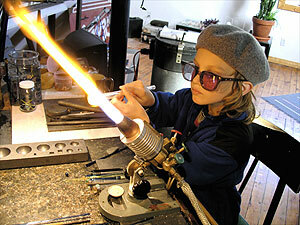 Galbraith began his glass-blowing career making neon tubes and laboratory equipment. 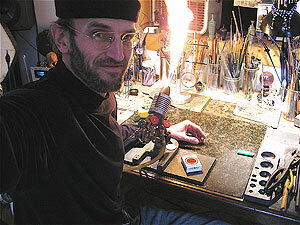 In the years since this industrial beginning, he has developed unique methods of achieving high color saturation within his challenging medium: the hard, borosilicate glass commonly known by the brand name Pyrex. He uses precious metals to fashion sweeping, galactic shapes. Tiny beads of gold and silver resemble moons in orbit around vaporous planets. 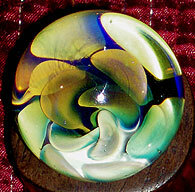 The natural magnification that results from making thick, round, perfectly smooth glass intensifies the effects of Galbraith's signature techniques. A few of the pieces follow a recognizable pattern or symmetrical design -- a golden flower inside a large marble, a series of swirls around a sake cup. Galbraith's experiments have been leading him away from "rigid patterns" and toward the asymmetrical, multilayered, "organic" look. "I am really happy where I am right now," he says. "I can't even duplicate my own work." With each piece he thinks of himself as "making a rock." And, indeed, when you stop in at the Li Pon store or Farmers' Market booth and see his work on display, you may feel like you are standing on a beach admiring the beauty of each pebble, hefting and caressing them one by one. It is hard to walk away without taking at least one of them with you. There is a good reason to set some things aside for still, untouchable viewing in museums and galleries. When we bring art into our everyday routines, we forget to look at it. The wearable art at Li Pon is beautiful and unique and took hours to create. Then you stick it in your ear, hang it around your neck, use it to hold down your paperwork in case a breeze comes through. Most of us are not listening for our accessories to whisper, "You must change your life." But perhaps as you stand in line at the bank or sit in afternoon traffic, your attention will turn to this lovely artifact in your possession. And perhaps instead of tapping your fingers, pushing the seek button on the radio, answering your phone -- perhaps instead of grasping about for the next thing or ten to happen -- you will take one quiet moment to touch this beautiful piece of art, crafted by the careful hands of another human being. Perhaps, if we are willing to pay attention, there can even be something sacred about the art we carry with us.